Permaculture is a design science introduced in 1978 by Bill Mollison and David Holmgren through their publication of “Permaculture: A Designer’s Manual“. The word “permaculture” comes from the combination of “permanent” + “agriculture”. Since food is vital for culture, permaculture is also “permanent” + “culture”. If you are someone who tries to buy the most ethical and healthy food you can, you are familiar with non-GMO, organic food. You are also probably familiar with the fact that eating meat is bad for the environment. However, permaculture food is beyond organic — it actually heals and restores our environment. Designing and encouraging permaculture systems, especially while including rotational grazing, are an important long-term solution for many of our current problems, increasing top soil (and thus increasing the ability to sequester carbon; see this article on a new technique for more accurately measuring carbon in soil samples), creating food, restoring trees, increasing the productivity of land, preventing erosion, feeding people, creating surplus to share with others, deepening resilience, and more. habitats that provide the Food, Fuel, Fiber, Fodder, Fertilizer, Farmerceutics (Pharmaceutics), and Fun (the 7 “Fs”). 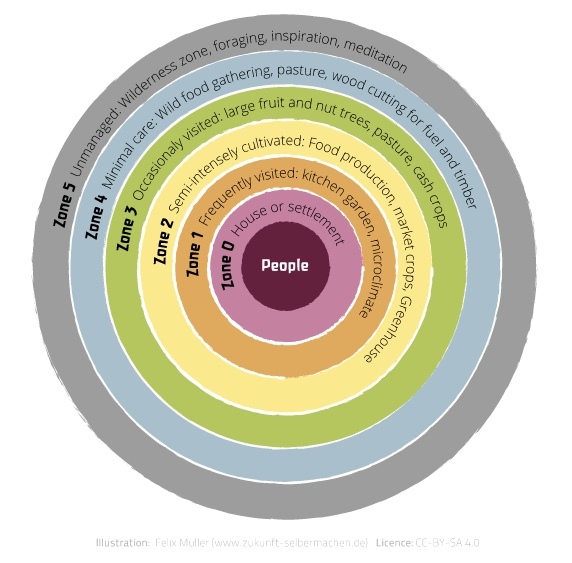 Permaculture systems are designed synergistically with the goal of one element serving multiple functions. For example, a chicken prepares the garden for planting by scratching, eats weed seeds, eats bugs, deposits nitrogen, and provides eggs and meat. If they are turned loose on food scraps, they are also composters. If all of this happens in a green house, their body heat and exhalation (of CO2) help the plants. 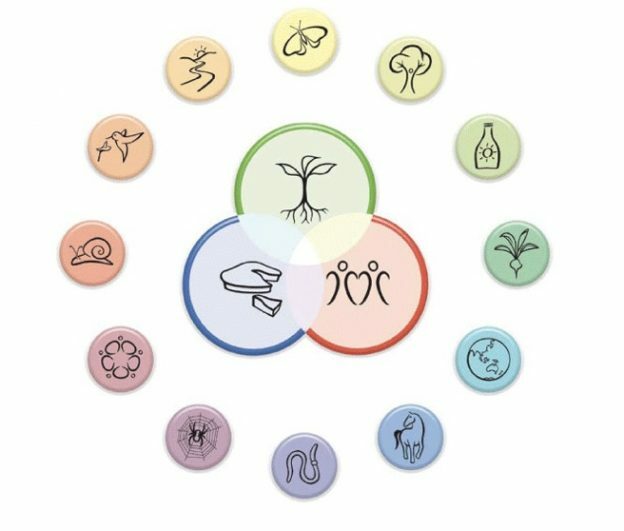 Permaculture is often associated with a few key concepts: The 12 Permaculture Principles (illustrated in the top image by David Holmgren), keyline design, the Five Permaculture Zones (as illustrated above), and the design of Food Forests (or Forest Gardens) that are collections of multipurpose, perennial (see wild rice in WI as an example of a perennial that used to be a mainstay in that state), diverse plants occupying multiple vertical layers (see graphic above) — and thus taking more advantage of solar energy than one-height monocultures — that are resistant to disease and varying climate conditions (because of their diversity) and produce the 7 Fs as already discussed. Our tiny, backyard permaculture project is an example of applying these principles. 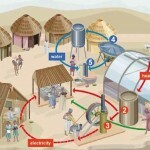 It is sometimes assumed that growing annual grains is antithetical to permaculture practice. However, this is not the case. It is perfectly sensible to grow annual grains alongside food forests as is done at Salamander Springs Farm in Kentucky using methods inspired by Masanobu Fukuoka’s techniques for growing rice and barley, techniques that involved permanent cover crops and broadcasting seeds. One of the costs of developing a food forest are the acquisition of a lot of trees. This article discusses propagating your own as a way to save costs. 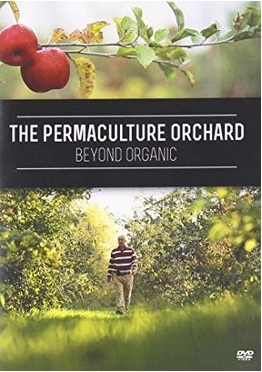 The movie, The Permaculture Orchard: Beyond Organic, highlights a model orchard designed to produce fruit and organized so people can harvest that fruit much like visiting a market. 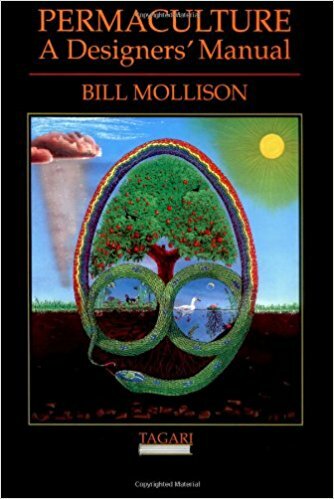 Permaculture was co-founded by Bill Mollison and David Holmgren in 1978 with the publication of the first edition of the “Permaculture: A Designers Manual“. Current editions are used today as the foundation for a standardized 72-hour Permaculture Design Course (PDC), taught throughout the world. The first 4 chapters are the core of the course and the manual according to Geoff Lawton (Geoff Lawton, Permaculture Voices 1, 2014: “The Permaculture Designer’s Manual in One Hour“) with subsequent chapters providing a focus for this core. The first four chapters cover the Introduction (Chapter 1), Concepts and Themes in Design (Chapter 2), Methods of Design (Chapter 3), and Pattern Understanding (Chapter 4). Subsequent chapters cover Climate, Trees (with emphasis on the importance of condensation), Water, Soil (including understanding the interaction of water and the carbon cycle to create soil), and earthworks (Chapters 5-9). Chapters 10-13 cover different climates from humid to dry to aquaculture and the final chapter (14) discusses permaculture as it relates to communities of people. Mark Shepard (WI, his book), the Bullock Brothers (WA), Paul Wheaton who also founded and maintains an excellent forum (MT), Willie Smits (Borneo), Geoff Lawton (Australia; also see, Greening the Desert in Jordan), and Ben Falk (VT, his book) are examples of practitioners (see more here). Like any group of people trying to do something, there are flawed aspects of permaculture (see this article for a social critique). There is also discussion of open source permaculture: using open source sharing of knowledge approaches to reducing trial and error on practical permaculture projects. The excellent film, Inhabit: A Permaculture Perspective, covers many of the concepts central to permaculture through the words of several permaculture practitioners. This post has been read 980 times.